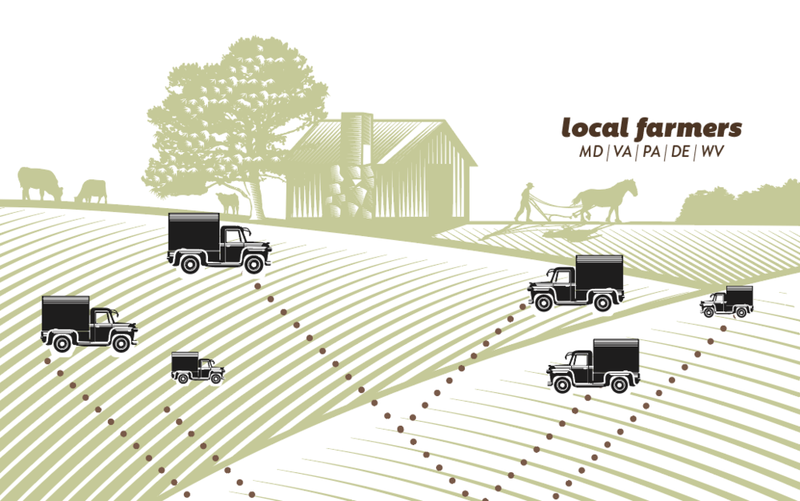 In 2017, CFW launched a new model of local food distribution where farmers markets serve as the platform to connect local producers to new and nontraditional wholesale customers. By tapping into the aggregation power of the farmers market, Community Foodworks can distribute thousands of pounds of local food beyond the market footprint. Every week in advance of the farmers market, Community Foodworks places large wholesale orders with each participating farmer, thanks to new demand from dozens of community-based institutions. These vendors pack up our order in the same vehicle they use to attend market, resulting in a truck more that's more than half-full. Vendors arrive at the market with their wholesale order on board. Community Foodworks team of staff and volunteers receives each bulk order and packs it up into corresponding wholesale orders [for institutions] and subscription orders [for individuals and families]. Interested in buying wholesale ? Looking for more info about our subscription programs? Community-based organizations that serve low-income residents-- such as daycare facilities, recreation centers, WIC clinics, mental health programs, and teaching gardens-- are increasingly eager to provide food access services to their clients. By tapping into this demand, Community Foodworks is able to expand food access and increase equity around local food, all while securing substantial new revenue for local farmers. Coupling these bulk orders with market participation rounds out the Pop Up Food Hub model. Linking wholesale procurement and retail purchasing allows CFW to create financially successful farmers markets in high-need areas where retail purchasing alone cannot sustain the market alone.